Dream is not all about colors. Dreams more often surpass the sense of the very word and transcend to a plane where it ripens into vision. Vision makes you strive for achieving what you initially perceived as your dream. When dreamers venture into making their dreams real, they make wonders. 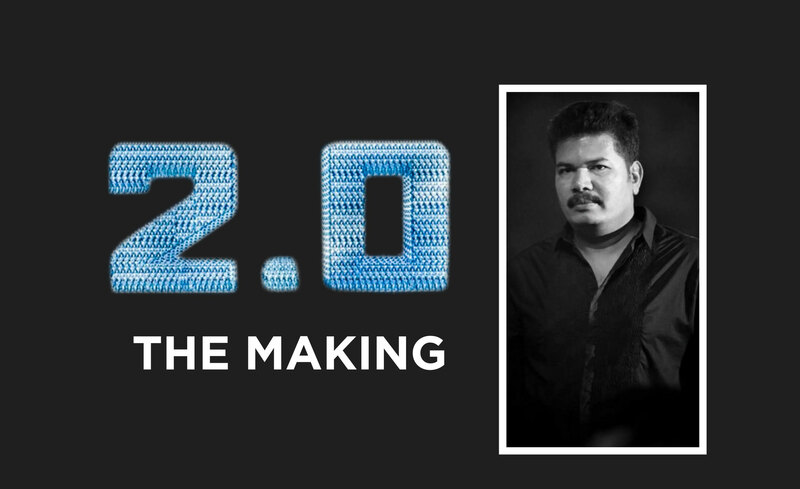 Here is “Shankar” the name synonymous to grandeur in the Indian film industry speaking about creating his close to heart project 2.0, and the varied technologies that made the 543 Million dream project come alive. I have always been passionate about the Idea of robotics and the self-programmed robots with incredible learning capabilities which I had pictured in my 2010 film Endhiran. For me everything starts from imagination; it’s imagination that breeds technology; creativity is all about putting your imagination at work. When I had imagined and written the entire story of robot, I wanted the robot Chitti to be embedded with the acumen of 100 efficient minds and that it could combat, make a punch, do a martial move much accurately, jump into blazing fire to save lives, and on the other hand it would sing like an expert would. When it came to portraying those attributes of the robot in the film, a single technology wasn’t enough for all those visual effects requirements. Whereas, the synergy of varied technologies aided us to achieve whatever that we were able to. I’ll get on to tell you about the combination of few technologies that helped us make some of the groundbreaking computational visualizations. If the robots with these special talents could be bought, we could have made it act and get the work done, but there wasn’t a prototype though. It was here the technology of animatronics came in. The animatronics department, with as many as 5 technicians through cable-pulled raw devices connected the hand, leg and head of the specially made puppet robot in metal that looked like Rajini sir. They coordinated and synchronized the limb movements of the metal figure and its head to realistic and diverse dimensions. The face got operated through a remote device. As a result of this synchronized live act, when the metal puppet moved along, those measured steps of the robot were a giant leap for the Indian cinema. If you would take a closer look, we were able to achieve much increased range of realism in eye movements, expressions and interactivity through animatronics. In my 2018 film 2.0 there was an emotional sequence of a radiated sparrow falling in the hands of the Ornithologist Pakshirajan, moments before its death. It wouldn’t work if you create such an event or rather one cannot even think of putting a real bird to torture. Animatronics aided us to actualize this tragic scene to dramatic effects. We had to sketch the wounded bird initially, based on the sketches we had to make a puppet bird struggling to breathe with stifling wings and twitched legs. We had the wings, beak and the head wired, and the technicians were controlling its movements and captured the dying bird. I had wanted the sound designer to design a specific tone for its death groan, when he did it was truly moving. This got applauded for its visual impact. Without animatronics this tragic act wouldn’t have been told visually. Further, there were those other instances where animatronics was not of any help, like when the robot runs into a blazing fire, jumps up walls and free skate or sped by the busy road. It was where the CGI (computer generated imagery) or digital creation came in with variety of animating methods. And out of which we made a 3D model of the metal robot to enable a photo-realistic dimension with face animation parameters. Further, we brought in a martial art expert, got him wired, fixed markers all through, and we connected his moves to a computer, then made him do the martial art movements, we then captured his moves digitally and applied it to the 3D model through motion capture technology. Later, we transferred the movements of the expert to the 3D model. This way, a 3D model of a metal robot performed the martial arts in lightning speed or danced like an exponent. These 3D models are becoming essential in today’s storytelling and to create new designs, atmospheres and universes. I always believe that one of the foremost functions of art is to take us to impossible places and bring in some miracles that reality doesn’t allow. When I wanted to tell an ambitious story of an innocent robot turning into a rogue, I imagined a moving image of 100s of Chitti robots building an army of itself and clubbing together to form a giant ball and rampage with a shooting mode. We wanted some unfettered movement of this spherical ball. All these ideas were brought alive by fully developed methods of live action animations. Then we wanted the photo-realistic faces of Rajini sir on every single robot in the army, the technology that allowed us do this was light stage technology. With light stage systems, we would place lights around Rajini sir’s face for about the entire 360° spectrum. These lights were of varied textures encompassing all possible lighting schemes from dawn to dark night. The two cameras on either side of his face photographed him at all the possible light levels, and we were given all the light variations of his face, and by stitching all these images we picked the one that suited the scene and pasted it over the face of every single robot in the ball. In the context of industry 4.0, 3D printing is a major theme. 3D printing will change the way,individual components and customized products are produced. We had used this new 3D printing in the film 2.0, which was much accurate, realistic and detailed. For some of the crucial sequences in 2.0, we had Rajini sir’s body scanned and got a 3D print that looked exactly like him; the admiring fact was that we could get this printed at all sizes. Even the 3.0 microbot in the hands of evil Chitti and Nila were actually 3D prints. Rather than building models by hand, we are now turning to 3D printing which is the hottest technology available today. To create these imagined realities and general environment, VFX team is using varied software, animation and compositing applications. The virtual cam is another new technology we used in this movie. To capture the impossible movements of the camera of such a virtual cam, Autodesk’s MotionBuilder software was used. We had used such exceptional camera moves during the clash of giants in the climax; the combat of the giant bird with the army of robots. Software that was put to use was Autodesk’s Maya to ensure precision in the particle dynamics of the giant bird. Software namely “Massive” was used for all of those multiple robot formation in “Enthiran”,and those of football stadium crowd simulation in the climax for 2.0. It’s a much handy tool for cost control and generating crowd environment and multiplying identical characters. To realize the sequence of an army of mobiles come whirling like a river, reeling up like a standing road or the swarm intelligence as we would call. And for all the other mobile phone formations we had used Houdini software that perhaps is a much developed simulation tool. We could simulate much closer to what we had imagined of the army of cell phones jumping over the gate and crawling in slowly to make the attack all of a sudden. This software helped us arrive at a desired speed, force and directions. When the story demanded a unique sound design, as the regular sound technologies at theatres would only make us hear the surround sound from both the sides and even from above. But by the demand of the story as I said earlier, I required the vibration sound of 1000s of mobile phones to come from beneath the ground. Coherently, the sound designer gave us technical inputs with which we arrived at a new sound format, “4D sound” for the first time in the world cinema, which would enable the audiences hear the wild rattle of vibrations from under the seats, this is the vivid sonic sound technology that brings in a real-time experience which perhaps make you feel that you are inside the scene. While I had worked with some of the world’s top VFX studios in US, UK and across the world, I could see that the Indian animation industry is also gaining acceptance around the globe. It is great to know that Hollywood nowadays is outsourcing Indian VFX talent. I have used mostly the Indian talents in my movies, but when it comes to creating certain complex, intricate work we expect some international VFX support for the want of creativity and artistry with technical finesse. However, I do see a boom in the VFX talent here; there are competent studios with creative abilities and technical excellence. They are working towards excellence and are almost getting there and they are walking that little extra mile in terms of artistry. I’m excited about the fact that if we could develop further in artistry, Indian studios will soon become global brands in VFX. I’m sure that in India we have that talent with artistic and technical excellence on par with world standards, but they remain untapped, unrecognized and isolated from the mainstream. Besides print and television media, this industry also comprises, of subsidiary industries like Animation, Graphic Design, and Video Gaming. Animation industry, which holds the key to this revolution, is expected to grow from the Rs. 13 billion at present to Rs 40 billion by 2013. Video Game industry, another important segment propelling the growth of media and entertainment industry as a whole, is projected to reach Rs. 300 million by the end of the decade. Graphic Design and Product Design industry is also witnessing an extraordinary growth. The contribution of Animation and Gaming industries to this overall growth is evident from the fact that Global Entertainment majors like Walt Disney, Sony pictures, IMAX, Warner Brothers have signed up huge contracts with Indian animation companies. Gaming Giant EA (Electronic Arts) and Microsoft have set up their own shops in the country for production and distribution of Computer Games. Chennai, Bengaluru, Hyderabad and Mumbai have emerged as major Animation production hubs not only for India, but also as a source of content for Global Animation Industry. WHAT IS DRIVING THIS REVOLUTION? The very same factors that were behind the IT revolution in the 1980s and 1990s are propelling this digital revolution in India. Unlike the IT industry, where outsourcing is the predominant business model, global players are adopting other models like Foreign Direct Investments (FDI), Co-production and Strategic Alliances. For the global animation industry, India offers significant cost advantages in terms of Real estate, Infrastructure and most importantly the trained and competent workforce. The making of a full length animated film, which might cost an estimated 100 million USD to 175 million USD in the United States, can be produced in India at only about 15 to 45 million USD which is actually a fraction of the cost. As a result international animation giants are looking to India. In 80's India identified the growing opportunities in IT and established itself as a Super power by the 90's. Similarly, the opportunity in Animation, identified in the beginning of this century is all set to repeat the IT success by the end of this decade. Companies like Rhythm & Hues, Electronic Arts (EA), Imageworks etc., operate as Indian companies. Thomson has formed a strategic alliance with Dreamworks and invested in Bangalore based Paaprikaas Animation Studios to produce world class animation in India. Warner Brothers and Prasad Corporation have formed a strategic alliance for Digital Intermediaries and Digital Restoration for Hollywood and Indian films. International investments are virtually pouring in. This growth is not merely driven by global markets as there has been a significant increase in demand in the domestic market. The domestic demand for Animation is due to various other factors. The success of Hanuman Returns – A fully animated movie has boosted the interest levels for animated movies in the domestic market. Adlabs along with Ocher Studios is producing a high-end CGI animation film titled 'Sultan - The Warrior' on Indian Superstar Rajnikanth. The film will have music by A.R. Rahman. The film will be launched in Tamil, Telugu, Hindi and English languages. Pioneered by the Indian advertising industry, animation in India has been adding creativity to commercial advertisements. The fully animated AMARON battery advertisement is a classic example. The list of commercial advertisements using animation is long, with products ranging from chewing gums and soft drinks to mobile phones and services like insurance. Visual effects (Visual FX or VFX), which had already started playing a significant role in Advertising, especially TV Ad Commercials, has also taken the Indianfilm industry by storm. The success of several Bollywood and Kollywood films like Krissh, Dhoom 2, Don, Shivaji, and Dasavatharam amongst many others, which had VFX as their USP, bears testimony to this.